A weighing pallet truck from Accuweigh is being used to perform mobile weighing duties inside the intrinisically safe areas of Dulux Paint’s Rocklea factory in Queensland. The weighing pallet truck has been fitted with an Intrinisically Safe digital weight indicator in order to comply with the hazardous area classification. The weighing pallet truck is used to readily weigh the net volume of paint being decantered into a container on the pallet truck. There is no need to transfer the loaded vessle to a scale outside the Intrinisically Safe area. The weighing pallet trucks are powered by a sealed rechargeable 12 V battery which is fitted under the headstock. It can only be recharged by taking the pallet trucks outside the Intrinisically Safe area. 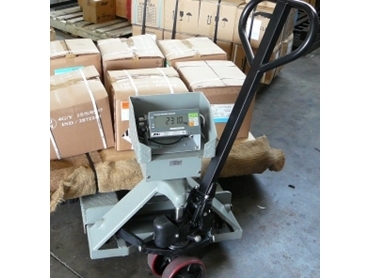 An industry standard pallet truck was fitted with four 1t beam load cells connected to the Intrinisically Safe Indicator for a weighing capacity of 3000 kg in increments of 1kg.